It’s Valentine’s Day, so naturally, gift giving is at the forefront of many people’s minds. However, this western holiday is just one of many when the exchange of gifts is customary. With the frantic, breakneck pace at which many of us live our lives, a trip to the mall may simply not be in the cards. Fortunately, thanks to convenient and well organized ecommerce platforms like this custom eBay Store Design from OC Designs Online, you can knock out your shopping in a snap. Don’t just take our word for it, see for yourself! Our design experts used a festive coral and turquoise color scheme to visually delight guests looking to fill their carts with gifts for loved ones. Next to the Madison Giftware logo, customers have immediate access to comb the eBay Shop‘s entire catalog and single out specific items for purchase. In the bright, beveled ribbon of the navigation bar, shoppers can elect to peruse company background information, view the store’s entire inventory of listings, or make contact with operators. Below, a hi-res graphic against classy wood grain welcomes visitors to the store before turning them loose to browse the selection. 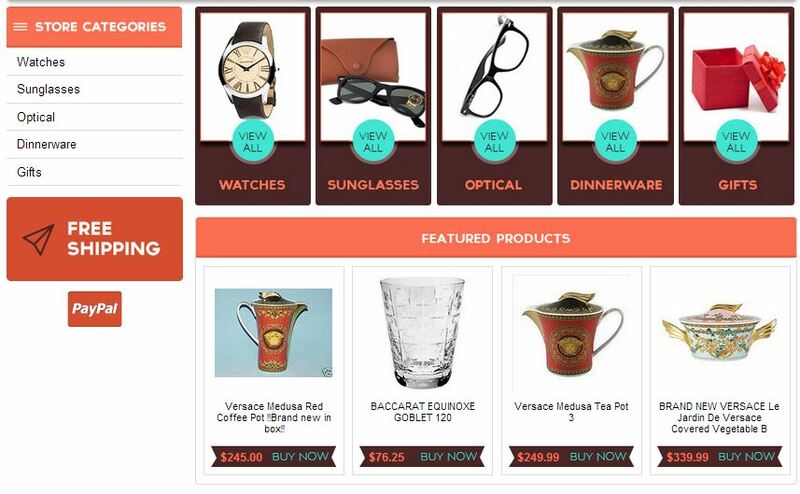 Next, the five store categories in the left sidebar are divided between watches, sunglasses, optical, dinnerware, and other gifts, making it a cinch to jump to the appropriate stash of goodies. The section continues with a clean yet colorful graphic alerting shoppers to the store’s free shipping offer and option to use PayPal to complete their transactions. In the midsection of this eBay Template store categories are listed out again, each with visual representation and complete with a pop of blue in the center inviting shoppers to ‘view all’. A four pane of featured products help Madison Giftware maximize their listings by displaying individual pieces in the site’s high traffic area. Finally, a block of bright robin’s egg blue houses a custom footer which pulls in key information including tabs from the main navigation bar, delivery policies and easy access to terms along side the logo. Ready to see how a custom-made eBay shop design can set your site traffic ablaze? We are experts in the template designs guaranteed to grow your online business. We invite you to browse our ever-growing portfolio and request a free quote! Like what you see? Be sure and ‘like’ us on Facebook and don’t forget to follow us on Twitter!